Got all the winter clothes "re-activated" and the summer clothes "de-activated"! 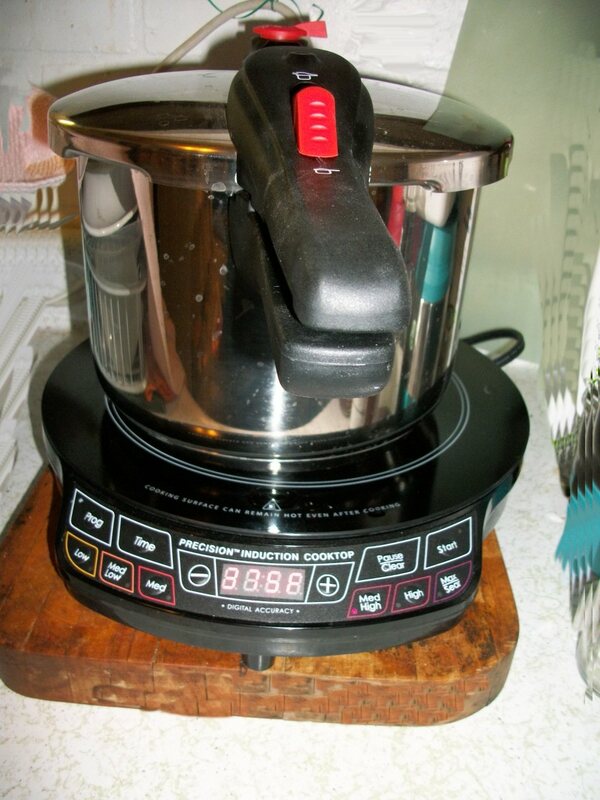 Also pulled out my induction cooker and the pressure cooker and stuck a chunk of meat and several chunks of sweet potatoes in it with a couple cups of water. Wahlah...dinner is served! Love that little piece of equipment; both the pressure cooker and the grill. Wanna see? Going to do a thorough clean once it gets light, tidy things for the weeks the house will be empty. Try to wrap all plumbing in cellar for cold weather while me is away and board up more windows. I canned 5 quarts of turkey stock yesterday afternoon and cleaned up the kitchen between football games. Crimony. I just about T-Boned a car tonight. I pulled out in front of a car BUT she didn't have her lights on! At 8:10 at night. Couldn't she see that it was unusually dark inside the car, like no dash lights were on? Idiot. Then she looked at me like it was my fault, until oncoming traffic started flashing their headlights at her. Probably drunk. Canning is so gratfiying ... until you have clean up your stuff! Jeeps with the holidays (and it's going to get worse) there's a lot of divers out there that are "under the influence" of something. So glad you were able to stay out of her way! We've had a few give us a "digit" when it's been their fault they didn't see us or ??? Our little town puts out a free newspaper every week and there are always 8-10 DUI's and drug stuff found in cars. Every week. One thing though, they publish the names of those being hauled in except for the minors. I expect idiot drivers after midnight and on weekends but this was 8:00pm on a Monday. At first she rolled her window down and started to get animated. Then she saw oncoming traffic flashing their headlights at her and she settled down. Unfortunately for her, she forgot to roll up her window. We pulled up at the stop light next to each other and I rolled down my window and yelled that her lights were off. She just threw up her arms and wouldn't look at me. I repeated that her lights were off. By this time I knew she knew that she messed up but I was hot! I did have time to say one last time, "Unless up WANT to get hit, TURN YOUR LIGHTS ON!" I felt better. She was so busted she couldn't even think to roll up her window so she couldn't hear me. It didn't dawn on me until after I got home that she was in the left turn lane at the light, and I was in the right lane with one lane between us. The person in the middle lane stayed back so I could stay in 'yelling distance' to her. They were either afraid of her or enjoying the show. If she would have said she was sorry I would have let it go. We all make mistakes but she didn't take responsibility and acted like it was my fault. Oh no she din't! Wow! Glad there was no accident! DD1 is traveling up to our house this morning, a 3 1/2 hr trip. Praying for safe travel for her. Every year, Mom gives us each $20 for Christmas and we go Goodwill shopping. This makes Mom exceedingly happy and we get some nice things for a great price. We pack a lunch and spend the whole day. In the past, we have hit three GW stores in towns 20-30 miles apart but last year we just stayed at one and that worked. This is Mom, DD1, DD2 and me. We shop for DH, DS and DSIL but it's harder to find things for them at GW. Nice men's clothes but all three of them are skinny, waists of 29, 30 and 31. DH is 31 and that's only because of his back brace. Without it, he would be a 29. Very seldom find pants to fit them at GW. DH likes 1000 pc jigsaw puzzles and sometimes we get find nice ones. We'll do grocery shopping for the month today too. It rained all day yesterday and Sunday. We ended up with 37 qts of applesauce and 6 -1/2 gals of juice. Makes a total of 112 qts of sauce and I forgot how much juice. Somewhere around 20- 1/2 gallons. We still have about 4 bushels of golden delicious apples left and lots of our own apples. We have 4 of these little hard apples that we can as slices because they hold that shape. They are really sweet but we can them in different flavors of juice. We have tried-apple, orange, pineapple, mixed berry, raspberry. They are delicious! We plan to try-pineapple/mandarin, strawberry-kiwi, and cherry. Actually we did try cherry but I didn't have enough and had to "water" it down with apple and white grape so it took most of the cherry flavor away so we want to do more of that. Is it possibly the lady was driving without lights cuz ....her lights didn't work? Spent the day upgrading the motherboard memory on our fleet of laptops, in preparation to converting them from WinXP to Linux mint. 512m to 2G. I did it so if they got messed up, it was my fault. Also tested the new 16g thumb drives. Lot of 20. Four not to full capacity. That took time. It is so frustrating, these are american made, but their QC is just as bad as china units. Spent a bit of time polishing the student sign-up sheets. Got a good crop of folks this time. Shame we do not have more husband seekers here. There is some prime stock on the hoof in this class, so to speak. Christy, my 'new' daughter, with me whole time. Timid, watching everything. The look on her face when she looked at the torx screwdriver... Precious. Got home to find Amos home early, his eye giving him more trouble. Looking forward to his appointment. Patched his eye, after cold vaporing. He had fired up the 'new' crock pot, and loaded it with beans this morning. He is about to learn why I do not normally do beans. After tonight I bet he will not do that again. Just a "bizzy" day for us. Started off picking up some grab-bag items to go in our Christmas gift bags for a Christmas party our friends are getting together to have. Working on another pair of ladies slippers for the gals and will make up some mint facial scrub and a lavender face smoother for the ladies. For the guys they'll be getting an LED flashlight and some emergency candles. Also picked up my supply of paper lunch bags and glitter glue to make my gift bags for this year. Love making those things! Stopped by the Moose Lodge to pick up our tickets for the New Year's Dance, then worked on windows again at the Homestead house. Got them all caulked but still have three to put shrink wrap over the bubble wrap, one to bubble wrap and three kitchen windows to bubble wrap and shrink wrap. Also want to try to tighten up the basement since the water heater is there and the pilot light will give off a bit of warmth. That will certainly help keep the water pipes even warmer. We haven't had any heat there since April, but the thermometer we put on the kitchen wall still says it's 51-52. It's supposed to dip below freezing for the next 2 or 3 nights, so we'll check it out tomorrow. Tomorrow MrWE2 has a client that needs a few things done so I'll work on sweet potatoes. Nope. She turned them on after being 'notified'. Ah....well at least she FINALLY did that! You probably did others [and her] a service that night!! Feeling "wiped out!" Canned sweet potatoes yesterday and peeling them things did a number on my lower back. Thought sitting in a chair with a bucket would be better...NOT! Not to mention my hands :-( But we'll be glad to see them on the shelf further into the winter. The price for them has already jumped up a quarter, so glad we got them when we did! Been running from pillar to post all week, getting very little done. One typical example: The doctor said he was re-upping my muscle relaxer prescription. CVS (drug store) said he didn't. While I was present in the store, CVS tried repeatedly to call to verify the prescription and could not get through the TOC (clinic) telephone system. They said they could not try again right then. Next day, same story. They said they do not fax. Calling TOC repeatedly and sitting through over twenty minutes on hold got me nowhere past a recording that said don't call us, call CVS and have them fax info to us. Another call got me to a lady who refused to take a message re prescription because I was supposed to call CVS. Last call (with--again--over 20 minutes on hold) got me to the actual voice mail of the actual doctor's assistant, which voice mail gave notice the messages are checked at four. By then, it was after four. Sometimes it's not the drugstore's problem. Our family doctor charges $5 when they fax a prescription wo we stop by and physically talk to his nurse and she calls it to the pharmacy. All this "press this for...and press this for..." is a mess! What in the world are people going to do if any of their areas have a prolonged power outage and they can't fax, call or email? Slept between 4:30 am - 10:30 am. Made big Brunch before DH went off to work. Go at 2pm to try to get water down the hose DH plugged this morning by trying to do it BEFORE it warms up at Two O'clock. Not earlier/not later. Lots of going back and forth. Hoisted hose over the parked van [which was making shade on plugged hose] Used a broom to lift if over....it warmed and finally gooooshed into horse tank. Go up and shut it off. Go down and lift up areas of hose not going severely downhill....so as to drain it well and pull it back to one side of driveway. Go back up to house and get out of barn clothes/boots. Go back down at 4:30 pm to feed horses, ducks, walk dog, shut in goats. Go back to house and get out of barn clothes/boots again. Get turkey into oven [after spending quality time getting some missed feather casings out of the cheap-brand bird.] Go downstairs to get potatoes and ......can't find one single can of green beans...dozens of canned peas [for post-hooey only, yuk] and the dog is barking her head off at the darkness - telling one-and-all that she's guarding till I come back up the (exterior) stairs. Aaauugh! Sit down and peel a whole mess of taters to boil. Pull out the rest of things [having a mini Thanksgiving cuz didn't have room for turkey in freezer.] ....and ready for DH to come home late. Triptiphan (sp) take me away! Smile yesterday is over. A young Amish man came and installed a SS chimney so now I have heat again. This mild weather has been wonderful, now to get my car fixed! I got a nasty big splinter in my finger so put a honey Epsom salts poultice on it last night. Think by the looks of the bandage the nasty got pulled out!! But the splinter is big and long maybe it will work itself through my finger and come out on the other side! Ow! Poor Twilight! I hate splinters! Bread and milk poultice draws. Also if a part of a splinter can get stuck to that poultice...let the bread dry out. Sometimes the splinter will stick like glued and will pull out when poultice removed. Depends on how deep. Today....after too much yesterday and NOT sleeping well again....I'm trembling/shakey Blech, I don't like this feeling. All jittery....and I don't drink coffee. MtRider ...not doin' nuthin today. Eating leftover turkey meal. Feeling better today. Gave the back a long rest by going to bed early (and reading for an hour or so) and sleeping in a bit. Never had any issues with sciatica on the left side of my back before, so having it on BOTH sides was pretty painful to say the least :-( But like I said, feeling much better. Even helped MrWE2 with 3 more loads of leaves and got them over to the Homestead. Took down the snow fence at the Roost (since some of it was blown down by high winds a week or so ago) and got it rolled up and to the Homestead. We'll run it across part of the back yard there that doesn't have any fencing. When we relocate there, we plan to privacy fence all of it so we're only putting up temporary on the unfenced part. The chain link will be the last to be taken down after we get the privacy fence outside of it. Got Abby-girl weighed at the vets today (when we got her meds...finally!) and she's 82# so we're increasing her food just a little. She's looking thinner than we want her to. She gets ample exercise and is so "hyper" that she really does burn off a lot of her food. She'll be getting a bit more for her supper meal. The ate her supper meal and has went straight to bed :-) A tired Abby is a good Abby ... but a tummy full Abby is a good Abby too! Plan to go to the Christmas parade in the morning. Weather is supposed to be about the same as today...sunny and in the 50's. Then I'm sure we'll find "something" that needs to be done. Been working on my garden, turning the soil and working in the straw from the chicken coop. Hoping to finish sometime next week and start planting roots. Carrots, beats, etc. Onions and garlic are planted in one of the other garden spaces. The wheat I planted sprouted 2 plants out of 1,000's of seeds. 8' x 16' 128 sq. ft.
Today, I have to deal with plumbing and still get the house clean. After the hens went to the 'sitters' they have been very subdued. They are now singing and cooing at me when I am out in the yard. We have had a couple days below freezing but nothing too drastic, 29 degrees F one morning.